During Altaroma, many new designers have had the opportunity to present their work at the Rome Marriott Grand Hotel Flora inside Room Service project curated by Simonetta Gianfelici. So the 15 rooms of the Rome Marriott Grand Hotel Flora become in small atelier to meet the designers and view the collections. In the 3th room I entered was exposed Co.Ro. collection. Co.Ro are the initials of Collegio Romano, the school where the two designers Constanza De Cecco and Giulia Giannini met. The designers both come from the world of architecture, studied jewelery design at Academia di Moda e Costume. 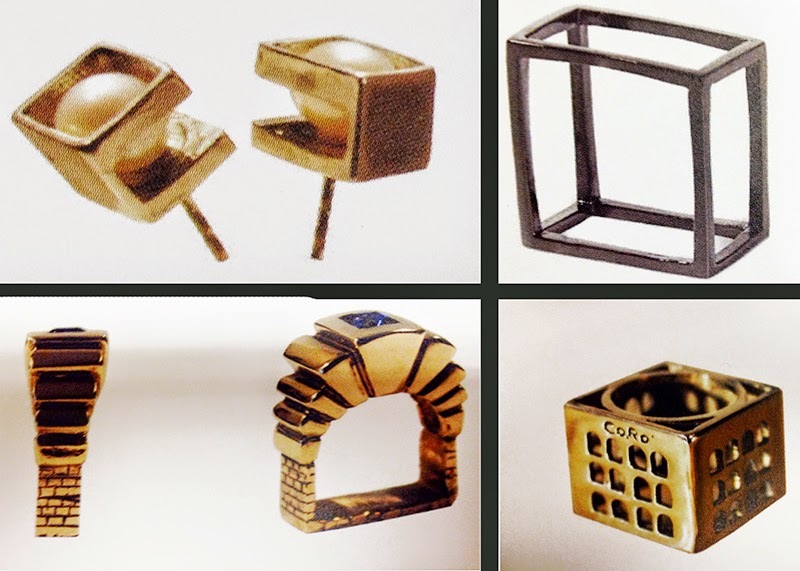 Often jewels inspired by architectures, buildings jewels, from mediterranean houses to ancient temples, up to industrial complexes, revisited with a twist of irony by playing with the principles of jump in scale and function. Handcrafted by Italian artisans, represent a harmonious fusion of rationalism and classical tradition. The composition method passes through a research focused on space, producing volumes and shapes that refer to geometries of structural forms enclosed in worlds of minimal dimensions.